The climate in this part of the Rhodopes is extremely favorable compared to other mountains in the country. The winter is long but mild, with lots of snow. The average mountain temperatures for January are between 7°C and -2°C. The snow lasts until the end of May on the northern slopes of Mt. Perelik and the highest ridges, providing excellent conditions for winter sports. Summer is cool here. The highest average temperatures for July can reach 18-19°C. Compared to other mountains, the Rhodoppes have the least number of days with strong wind and fog. The region boasts the highest number of sunny days and clear nights. This is the reason for the building of a national astronomic observatory near Rozhen in 1981. A large part of the especially the resort of Pamporovo and the village of Stoikite, experience a unique natural phenomenon - a negative air ionization, which is extremely favorable to human health, believed to give new strength and energy. 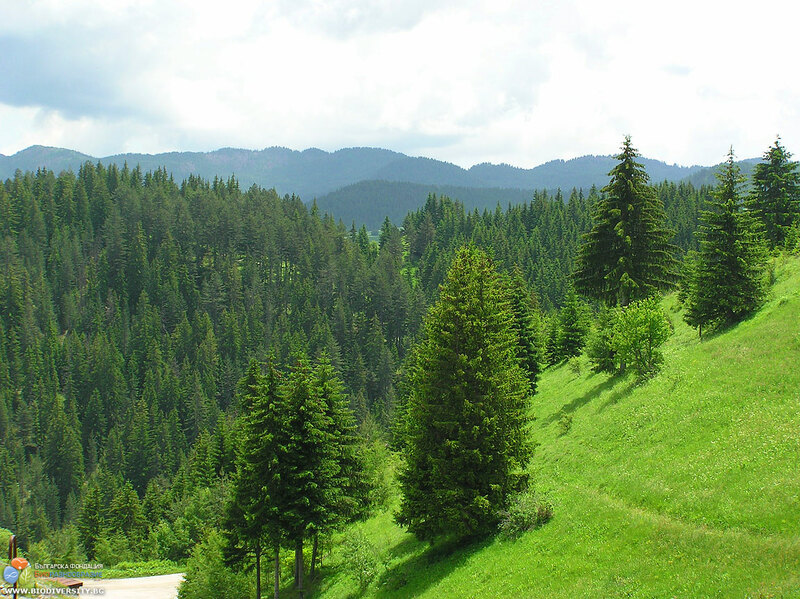 Thick coniferous forests on the mountaintops produce the so-called phytoncides, which makes the air especially good for people suffering from asthma and chronic diseases of the upper respiratory system. The Rhodopes are a unique system of mountain ridges and deep river valleys. According to geological features, they divide in two subzones - Western and Eastern Rhodopes. This guide regards the eastern part of The Western Rhodopi Mountains, which is also known as the Middle Rhodoppes. The make up of the mountain ridges in the mid part of the Rhodoppes is comprised of granite plutonium and - above it - prepaleozoic and Paleozoic metamorphic rocks. At a number of places, these are covered by paleogenic sea deposits (sandstone, conglomerates) and volcanic rocks. Here you can find the highest peak in the Rhodopes - Mt. Golyam Perelik (2191 m above sea level). The river valleys and gorges that cut into the rocks are wild and impressive. Best known among them are the Trigrad and Buinovsko Gorges, thecanyons in the upper course of the Vacha River, and others. Cracked rhyolite in the shape of various prisms has formed vertical rock walls - real rhyolitic peaks in gray-and-pink colors - above the town of Smolyan, bearing names such as the Big Wall, the Small Wall, the Bride and Turlata. In the areas of paleogenic lake deposits, there are conditions for the sliding of volcanic rhyolite, which predetermines the appearance of the famous Smolyan Lakes, close to the town of Smolyan. The unique rock formation, covering an area of 40,3 hectares, can be found along the course of the Aidarsko Dere River, under the Ridge of Chernatitsa. The bridges are most probably the result of an ancient cave collapsing in an earthquake. The river has carried away most of the smaller rock debris. 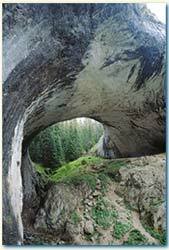 In time, atmospheric processes have shaped the two natural marble bridges of extraordinary beauty. The bigger bridge is 12-15 m in width and 96 m in length, with an opening 45 m deep and 43 m wide. About 200 m down the ravine, there is the second bridge, which is 60 m long. At an average of 1,450 m above sea level, the site is easily accessible all year round. The road leading to it is a deviation of the Asenovgrad-Smolyan road, passing by the village of Zabardo. Signed tourist trails connect it with the village of Zabardo and the huts of Kabata, Skalnite Mostove, Persenk and Izgrev. The tourist lodge of Chudnite Mostove is right next to the upper Rock Bridge, while the Skalnite Mostove Hut lies 1.5 km up the road. 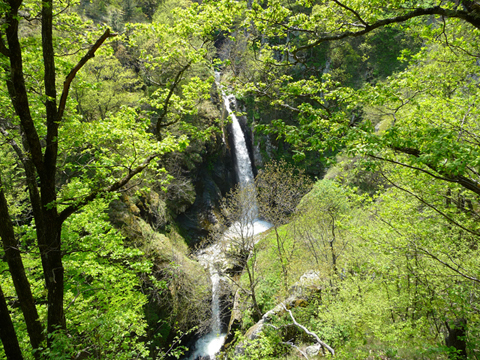 (The Buynovsko Gorge) The gorge is located on both sides of the Buynovska River, a tributary of the Vacha River. Soon after the deviation at the village of Teshel, the rocks narrow over the river, forming an impressive gorge. The turbulent mountain waters have cut their way through the limestone rocks creating a natural site of unique beauty in the Rhodopes. The sheer cliffs come so close together that it seems easy to jump from one to another. The spot where rocks almost meet has been called by local people "the Wolf's Jump". The Yagodinska Cave is the ''pearl in the crown'' of the Rhodope Mountains. It is 10 km long, and 5 stories tall, with many labyrinths and abysses inside. Visitors enter the cave through an artificially dug opening, while the natural entrance is 30 m above. A special path through the cave offers the opportunity to see the wonderful underground world formed in the course of millions of years. Electric lights make the mysterious formations: raperies, pipe-like stalactites, cave pearls, ''leopard's skin'' and hanging stalactone visible along with many others. The upper floor was well-known to ancient Eneolithic inhabitants. The cave is near the village of Shiroka Luka. It is over 1,400 m in length and is the fifth deepest cave in Bulgaria. An underground river flows through the cave bottom. For millions of years, underground forces have created wonderful cave formations. In order to reach the bottom, one has to pass 46 waterfalls. The name of the cave (Icy Cave) is related to an interesting natural phenomenon: in the summer, due to the circulating air, a huge ice stalactone grows in the first cave hall. The cave has not been adapted for tourists and it can be visited only with a special equipment and experienced guides! Although inhabited for thousands of years, the Rhodopes still harbor in their bosom wild places that seem to be untouched by humans. The Rhodopes are one of the few mountain ranges in Europe where the Brown Bear and Wolf still breeds. Old-growth forests are home to deer, elk, fox, wild goat, and other rare European species. The Eastern part of the Rhodopes is a true heaven for bird lovers but the western part should not be overlooked as it contains over 200 species, many of them quite rare. The Trigrad Gorge is the kingdom of the famed Wallcreeper - you can observe this wonderful bird while sipping your coffee at the entrance to the Devil's Throat Cave. Dippers and King Fisher will dart around you as you walk along clear creeks and streams. A Golden Eagle hovering high in the sky presents an unforgettable sight. If you come to the Rhodopes during spring you might hear the early-morning mating call of the Capercaillie. Lush, grassy meadows pop into mind when thinking of the Rhodopes. For many centuries locals have kept herds of sheep, as a result of which, they have created meadows outrests. These meadows now are home to an abundance of rare flowers, many of which are not found anywhere else on Earth. In early spring you can see the pink petals of Silivriak (Heberlea rhodopaensis), the symbol of the Rhodopes, which has the unique quality of being able to spring back to life even after being pressed for years. Legend has it that the flower bloomed out of the blood of Orpheus after he was dismembered. The Rhodopes are also well known for their mushrooms. Here you can also pick yourself a multicolored bouquet of herbs; the most fragrant thyme grows here. If you are still not convinced that the Rhodopes are a slice of true, wild nature, then the only other option that remains is for you to come here and see it for yourself.